Endemic to Baja California in Mexico where the main threat is likely to be from an increase in the severity and frequency of fires due to fire suppression policies, coupled with the likely impacts of climate change. Endemic to Mexico: This variety is confined to steep slopes in San Pedro Martír Mountains, Baja California Norte, Mexico. Within that area it has been recorded from the following localities: Canon del Diablo (down to 1150 m), Arroyo de la Grulla, Cerro La Encantada (type locality ‘‘upper end of the meadow 2300 m’’), to summit of Picacho del Diablo (3095 m), E of Corral Meadow on E escarpment and S along N-facing gullies on granite exposures to the primary population on Picacho del Diablo above Vallecitos, Los Llanitos, 2400 m, locally on ridge extending out into E escarpment 5 km E of the northern end of La Encantada (2400–2600 m), and Cerro la Botella Azul, 2840 m (Thorne et al. 2010). The extent of occurrence is estimated to be about 250 km² with a much smaller area of occupancy of arbout 30 km². These estimates reflect the occurrence of the main vegetation types in which it occurs. Its elevation ranges from 1150 to 3025 m with most stands above 1900 m asl. 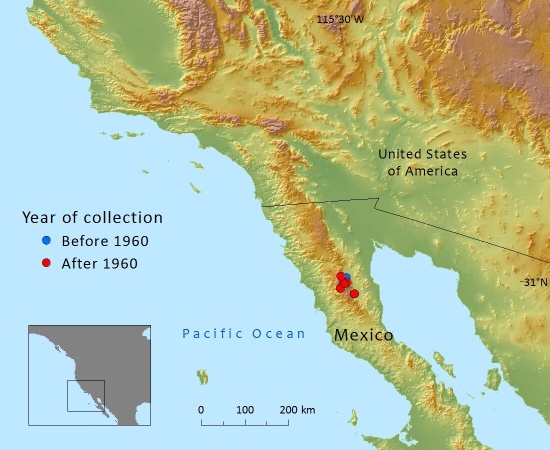 Previous estimates of EOO and AOO used for IUCN assessments have been based on a limited number of herbarium specimens.The primary population is located on Picacho del Diablo where it is frequent and locally abundant. In other areas it is less common. Summer grazing may have a limited impact in some areas but the majority of the vegetation type in which this taxon occurs appears to be unaffected (Bojorquez-Tapia et al. 2004). A more significant threat comes from climate change with changes in precipitation regimes forecast and an increase in extreme temperatures and droughts (Meko et al. 2013). This could be amplified as fire suppression policies within the National Park lead to an increse in frequency and severity of fires (Minnich 2000, Rivera-Huerta et al. 2015). The remaining trees are found within a national reserve. Farjon, A. (2013). 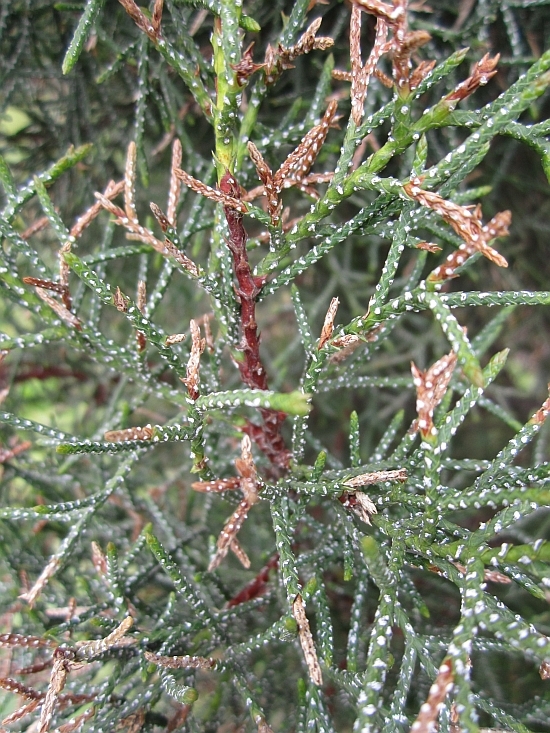 Cupressus arizonica var. montana. In: IUCN 2013. IUCN Red List of Threatened Species. Version 2013.1. . Downloaded on 05 July 2013. Adams RP, Bartel J, Terry R, Callahan F & J Bisbee. 2014. Taxonomy of Hesperocyparis montana, H. revealiana and H. stephensonii: Evidence from leaf essential oils analyses and DNA sequences. Phytologia 96(2): 71-83. P.Thomas, 2016. Cupressus arizonica var. montana, from the website, Threatened Conifers of The World (http://threatenedconifers.rbge.org.uk/taxa/details/886).